The DLA line of differential transmissions provide a narrow band of variable output speed ( +/- 0.50 to 10% of output speed) while at the same time insuring that any speed set within this band will hold as well as fixed gearing ( i.e. less then +/- 0.005% deviation). Therefore, the DLA provides the accurate speed setting and precise holding required to insure web or strip tension control. The drives consist of an differential drive enclosed in a nearly cubic housing with co-axial input and output shafts, and a speed correction flange. 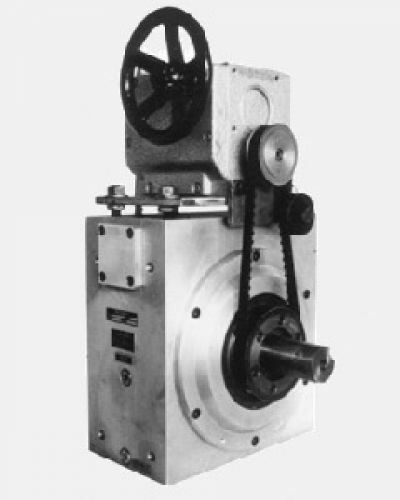 Mounted on top is a high-qulaity, all steel H-Drive Mechanical Speed Variator, connected by timing belts to the input shaft and correction flange, to form a closed loop mechanical system. It is also possible to replace the mechanical variator with a variable speed electric motor. Maximum torque capacity in minimum space, up to 12,400 lb. in.